Oh my goodness, I’m so in love with the sheet pan dinner trend that’s happening. In a lot of ways, it’s even better than one pot meals because it barely requires any attention. And I seriously love the flavor that comes from roasting, especially veggies. 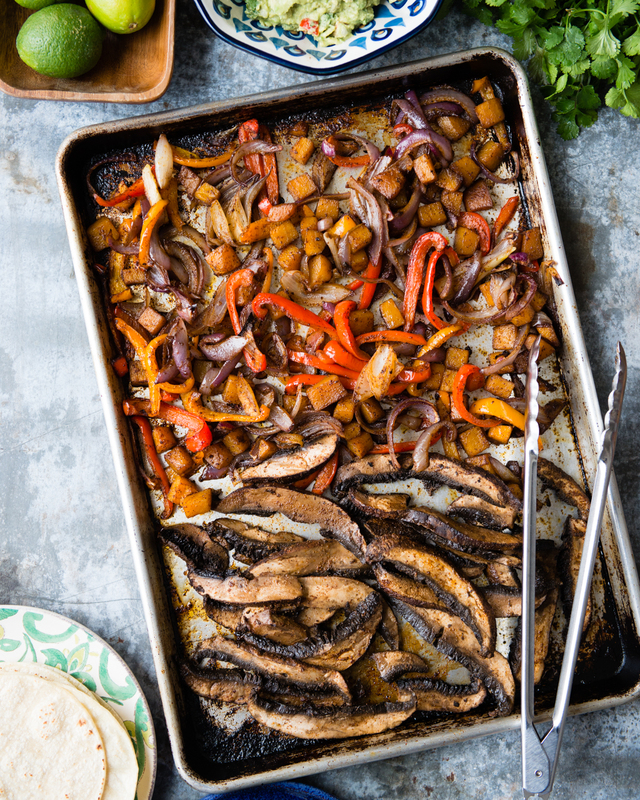 These Veggie Sheet Pan Fajitas received very high marks from my tough crowd. My recipe is based on another recipe I found recently. I’m always trying to incorporate more veggie-based meals into our week, and I loved the idea of doing vegetarian sheet pan fajitas instead of chicken or beef. To add some “meatiness” and make them more hearty, I used thick strips of portobello mushrooms and diced butternut squash. Naturally, I had to include peppers and onions because they aren’t fajitas without them! I used corn tortillas as a gluten-free option, but feel free to substitute coconut flour tortillas, or even large lettuce leaves if you’re looking to cut down on carbs. I can even see the filling being used for fajita bowls with brown rice or riced cauliflower too. The leftovers were fantastic the next day for breakfast–gotta love a meal that gives you so much bang for your buck! 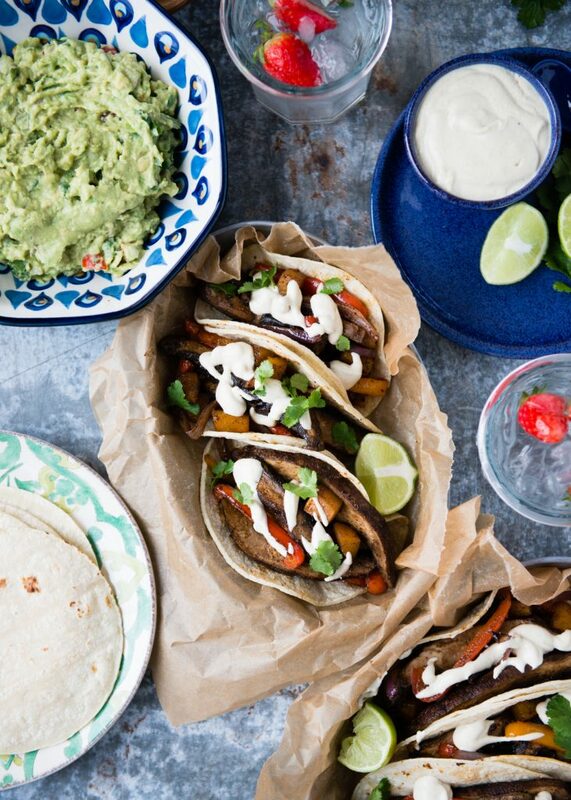 Adapted from VeggieTot's Sheetpan Chickpea Fajitas. Preheat oven to 450°F. Lightly oil a large rimmed baking sheet. In a small bowl, stir together the ingredients for the spice mixture. Set aside. In a large bowl, toss together 2 tablespoons olive oil with the peppers, butternut squash, and onion. Add half of the spice mixture and toss again. When the oven is preheated, place the oiled baking sheet in the oven to heat up for 5-7 minutes. Spread the veggies on the preheated baking sheet in an even layer. Return the sheet to the oven and roast for 10-15 minutes. Meanwhile, place the mushroom strips into the same large bowl that was used for the veggies. Drizzle the remaining 1 tablespoon oil over the mushrooms and sprinkle evenly with the remaining spice mixture. Gently toss. Remove the baking sheet from the oven and scoot the veggies off to one side. Place the mushrooms in the empty spot. Return the sheet to the oven and continue roasting for an additional 15-20 minutes, or until all of the veggies are tender and have started to turn brown on the edges. While the veggies finish roasting, prepare the Cumin-Lime Crema. Place all of the ingredients for the crema into a blender or food processor and blend until smooth. 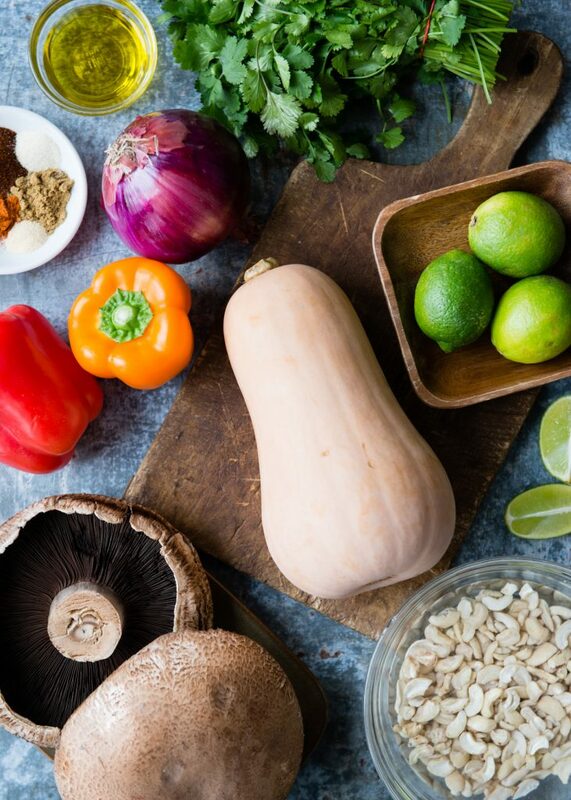 To serve, place about 1/4 cup of the veggie and mushroom mixture into each tortilla and top with a drizzle of the Cumin-Lime Crema , a scoop of guacamole, if desired, and a little fresh cilantro.